Okay, you guys. I have finally gotten my S word together enough to get a blog post together. Life has been SO busy. And when I have a free second, I just want to collapse on my sofa and watch Downton Abbey. But I powered through this weekend and got my life together! Hurray! If you follow me on Instagram and watch my Instagram stories, you already know that I meal prep my breakfasts, lunches and dinners for the week. And I have to be honest. I am a reluctant fan of meal prepping. If given the option, I would rather cook a meal fresh and eat it up while it's warm. But life is busy and if I don't have things already prepped, you can find me in the Chick-Fil-A drive-thru. In my opinion, there aren't many resources out there for vegan meal prepping in a way that is economical (aka CHEAP) or easy. I am a lazy vegan and I will do whatever is the yummiest, cheapest and quickest. So, today, we are making a hearty winter buddha bowl. I ate this for lunch every single day last week and you guys, eating healthy has never been so filling and delicious! Before I gave up meat, I used to think, "But what is going to be the main portion of my meal?" We have been conditioned to center our meals around meat but I love that in a buddha bowl, every ingredient gets to shine! Plus, I got all of these ingredients from Alid and it was less than $15....YEAH. This bowl is going to be made up of brown rice, smoky sweet potatoes, spicy kale salad and balsamic brussel sprouts. This bowl will fill you up, power you up and keep you SO full and your energy high! Chop all of your sweet potatoes into cubes. Place on a silicone baking mat on a large tray. If you do not have a silicone mat, you can simply grease your tray. Sprinkle your sweet potatoes with salt, pepper and smoked paprika. Place in the oven for 20 minutes or until completely cooked. Place de-stemmed, chopped kale in a bowl. Drizzle tahini, soy sauce and lemon juice onto kale. Massage with your hands for a few minutes. Sprinkle on garlic powder and cayenne. Mix thoroughly. Cut the brussel sprouts into halves. Heat a large pan on medium heat. Place 1-2 TBSP of water into the pan and place brussel sprouts into the pan. You want to let the brussel sprouts brown up a bit. After a few minutes, add in the garlic, stirring occasionally. Drizzle on the balsamic vinegar, coating all the of brussel sprouts. Stir occasionally until the brussel sprouts are tender. 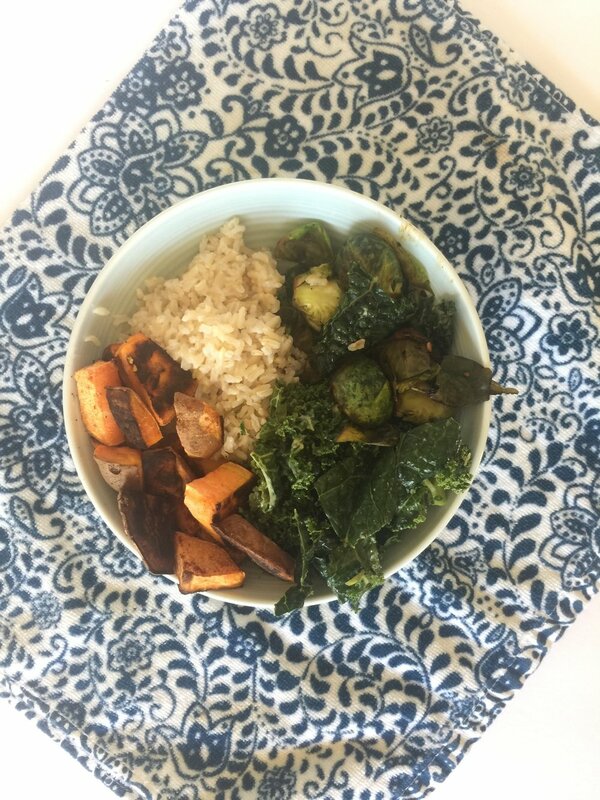 Assemble your buddha bowl-- place a cup of brown rice into each meal container, followed by a cup of kale salad, a scoop of sweet potatoes and a scoop of brussel sprouts. Keep in the fridge for up to a week! Are you a meal prepper? What are some of your favorite meal prep recipes?